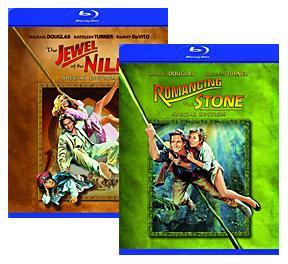 Fox has announced final specs for the '80s adventure hits 'Romancing the Stone' and 'The Jewel of the Nile,' which will come to Blu-ray this October with all-new bonus features. As previously reported, Fox will release the Michael Douglas-Kathleen Turner starrers concurrently on October 14 as stand-alone releases, timed day-and-date with new standard DVD re-issues. Now the full specs are in, with a wealth of newly-produced bonus materials that should please fans. Extras on 'Romancing the Stone' include a suite of four featurettes ("Rekindling The Romance: A Look Back," "A Hidden Treasure: The Screenwriter," "Douglas, Turner and DeVito: Favorite Scenes," "Michael Douglas Remembers") and eight deleted scenes. 'Jewel of the Nile' features an audio commentary by director Lewis Teague, a pair of featurettes ("Romancing The Nile: A Winning Sequel," "Adventures of a Romance Novelist"), six deleted scenes and the original theatrical trailer. Tech specs are identical on each release, with a BD-50 dual-layer presentation with 1080p/AVC MPEG-4 video (2.35:1) and DTS-HD Lossless Master Audio 5.1 Surround tracks. Suggested retail price for the Blu-rays has been set at $39.98 a pop. You'll find complete specs for 'Romancing the Stone' and 'The Jewel of the Nile' linked from our Blu-ray Release Schedule, where they're indexed under October 14.